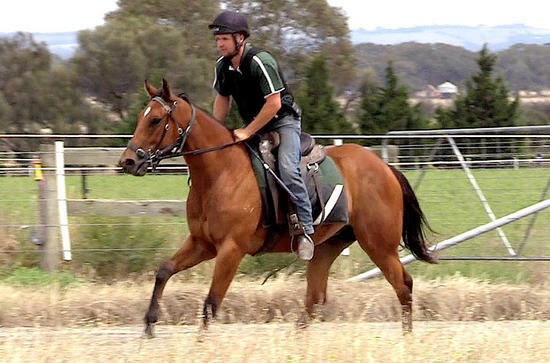 REWARD FOR EFFORT (AUS) (Bay 2006-Stud 2011). 4 wins-2 at 2, MRC Blue Diamond S., Gr.1. Sire of 299 rnrs, 173 wnrs, inc. SW Gold Symphony (MRC Vain S., Gr.3), Ability, Brugal Reward, Take Pride, Blondie, Dalradian, Desert Lashes, SP Gratwick, Tuff Bickie, Fancy Rumble, Sheriff John Stone and of Effortless Reward, Hell of an Effort - D'Great Effort (Mal. ), Jevilla, Montana Star - Star Superior (H.K. ), Petite's Reward, Copy Boy, Fully Maxed, etc. BOLD ROCK, by Fastnet Rock. Unraced. This is her first foal. Eight Stars - Luen Yat Nediym (Mac.). 2 wins at 1350m, 1400m in Aust. and Macau, 3d MRC Shadwell Estate Co (UK) 2YO Cup. Diamond Indulgence. Winner at 1100m in Aust. Bold Selection (Redoute's Choice). Winner. See above. Our Renaissance. 7 wins to 1200m, A$170,755, to 2016-17, ATC Noel McGrowdie H., Turfcare Australia H., 2d ATC Happy Retirement Chris Scott H., 3d ATC McGrath Estate Agents H.
Rich River. 5 wins from 1400m to 2400m, A$186,995, MRC Swimwear Galore H., MVRC Melbourne Signage Concepts H., SAJC Where's Lewy Grantham H., 2d MRC Le Pine Funerals H., Geelong Australia H., MVRC 1print Kerry Gillespie H., SAJC Corporate Events at Morphettville H., Ubet Festival of Racing H., Drink Driving? Grow Up H., 3d MRC Telstra Business Centre Dandenong H.
Straleta. 5 wins at 1200m, 1400m in Aust. and Malaysia, Selangor TC Sa Sa Fashion on the Turf Trophy, WATC Perthracing.com.au H., 2d WATC Magic Millions Sales at Belmont H., Connector Drilling H., Tabtouch.mobi H., Perthracing.com.au H., 3d WATC Wheelchair Sports WA H., Playeronline.com.au H.
TRIPLE ASSET (Nadeem). 4 wins at 2, A$267,385, VRC Thoroughbred Breeders S., Gr.3, SAJC Jansz S., Gr.3, TTC Magic Millions 2YO Classic, TRC Tote 2YO H., 2d TTC Gold Sovereign S., L, Elwick S., L, 3d TTC Betfair 2YO H., 4th SAJC Sires' Produce S., Gr.3. VOODOO BEAT (Sir Tristram). 7 wins from 1200m to 2400m, A$147,855, SAJC Port Adelaide Cup, Gr.3, Dairy Vale 500ml Stubby Quality S., 2d SAJC Japan Trophy H., L, 3d VRC Duke of Norfolk S., L.
SAVANNA AMOUR (Love Conquers All). 7 wins-1 at 2-to 1400m, A$631,823, to 2017-18, MRC Angus Armanasco S., Gr.2, WW Cockram S., Gr.3, How Now S., Gr.3, Gold Coast Guineas, Gr.3, BRC Hinkler H., L, Zouki Group 3YO H., 2d VRC Skip Sprint, Gr.3, 3d MRC Kevin Hayes S., Gr.3. GOOD BABY (Hussonet). 15 wins from 1100m to 1700m, 2,682,223Rgt. in Malaysia, Penang TC Malaysian Magic Millions Classic, L, Perak TC Sultan Gold Vase, L.